If you want good crab cakes at home, look no further than Whole Foods. They have prepared crab cakes or all the makings to cook your own from scratch. Their Alaskan King Crab Cakes with roasted red pepper tartar sauce are phenomenal, and perfect for a weeknight dinner. Just heat in a skillet and serve. 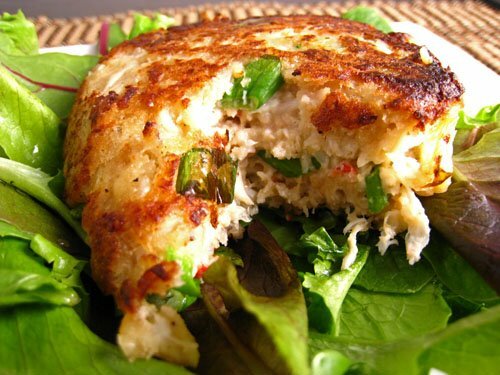 If you're in the mood to do some cooking, here is my take on recreating these delicious crab cakes. Alaskan King Crab Cakes with Red Pepper Tartar Sauce 1 lb. Alaskan Red King crab meat (or the best quality crab you can find in the seafood section) 1 cup panko breadcrumbs 2 tablespoons chopped cilantro leaves 2 tablespoons chopped flat leaf parsley leaves 2 tablespoons finely sliced green onions 1/3 cup finely sliced red peppers 2 teaspoons dijon mustard 3 teaspoons mayonnaise 2 tablespoons lemon juice 2 eggs (beaten) Old Bay seasoning to taste Salt and pepper to taste Mix all ingredients in a large bowl. Shape into 6-10 cakes. Place on plate and cover with saran wrap. Let chill in refrigerator for 30 minutes, before cooking. 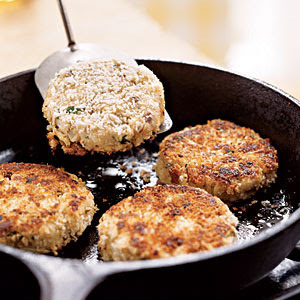 Heat skillet over medium heat, and cook crab cakes for 5 minutes on each side or until golden brown. For sauce: 1 red bell pepper 2 tablespoons capers 2 teaspoons tarragon 1 tablespoon lemon juice 1/2 cup mayonnaise salt and pepper 1. Cut one red bell pepper in half and remove seeds. Place skin side up on a baking tray, drizzle with olive oil, sprinkle with kosher salt and pepper. Roast in oven for 10 minutes until skin starts to blacken. Let cool and then chop finely. 2. In food processor, combine roasted red peppers, capers, tarragon, lemon juice, mayonnaise, salt and pepper. Pulse until smooth. Spread sauce on plate, and serve crab cake on top.